The episode begins in 1959 on a military base. Soldiers are playing poker and suddenly they splintter. I have to admit this threw me for loop because these soldiers have not had any connection to the story to date. We next shift to Cassie and it's clear from her behaviour that something strange is going on. She injects herself and then splinters to 2044. The sound of the machine gets Jones and Eckland out of bed. It's clear that despite all of the walls that Jones has put up, Eckland has gotten through to her. It's really nice to see Jones happy for a change but of course, this cannot last. Everyone gets together and Cassie tells them about her interactions with the Witness. She does however hold back that Witness not only appeared to her as Aaron but as Cole as well and that the Messengers made her drink their hallucinogenic potion. There's a lot of doubt as to what really happened to Cassie though she is insistent that she didn't hallucinate her time with the witness. It's not long before the splintter machine starts acting up. It shoots out a test subject from five years ago and the soldiers from 1959 also make an appearance. For Jones this is a case of chickens coming home to roost. This is all a distraction to stop them from shutting down the machine before it turns the facility into a crater. Cassie is taken over by the Witness and she kidnaps Sam and locks him in a room with a gun pointed at his head. Seeing how desperate the situation is, Eckland decides to sacrifice himself to buy them a little bit more time. It's sad as Jones begs him not to do it but Eckland seems to think that sacrificing himself for a beautiful woman is a great way to go out. There were so many things to love about this character and his exit from the show happened far too soon. Ramse and Cole both confront Cassie, with Ramse more than prepared to shoot Cassie in the head to protect his son. Seeing how precarious the situation is, Cole directs Ramse to shoot him instead, certain that Cassie will not allow him to die. This is meant to be evidence that despite the recent distance between Cassie and Cole that they know and care about each other. This plan works and Cassie rushes to Cole's side. After confirming that Sam is okay, Ramse shuts down the machine. The crew doesn't get to party and celebrate because the machine shoots out some negative energy and Sam disappears. After things have calmed down, Ramse and Jones talk about the possibility of Sam surviving but Jones has no firm answers for him. A despondent Ramse grabs his bag and leaves the facility. Both Jones and Cassie are riddled with guilt for what they believe to be their role in what happened. Jones gives Cassie injections to take so that the Witness can never take control of her again. As it turns out, Sam did manage to survive the feedback and arrives somewhere around the year 1,000, calling out for his father. Sam is met by who I can only assume to be the Witness. It's clear now that Sam has a much larger role to play in what is going on. Also, can Ramse ever catch a damn break? Earlier in the episode, Jones suggested that the Witness had the same capabilities as they do. I think that's obvious now with his ability to take over Cassie's mind and mind travel. I gotta say mind time travel is like one bad acid trip. Cassie heard voices and saw visions and I cannot help but wonder if this will increase her empathy towards Jennifer Goines. There's still a lot of relationship angst going on between Cassie and Cole though he took the time to say that he wasn't jealous about her relationship with Deacon. Here's the thing, they've been writing these two characters as though they have a budding romance going on and it's completely helped by the fact that Cassie seems to be one of the few women alive in 2044, who could potentially be a viable romantic interest for Cole. I would much rather see them as equal partners working on this situation together. With all of its time travel and twists and turns, what 12 Monkeys doesn't have time for is relationship drama. I would rather them settle in on a story than launch into will they or won't they territory. Saying goodbye to Eckland actually hurt more than I thought it would. I can only hope that he is somehow stuck in the machine and will reappear at some point. The moment Eckland volunteered to work with Deacon there was no doubt in my mind that he had become dead man walking. I did however enjoy the idea that he was a pacifist and so therefore didn't want to hold a gun. It made for comic relief and made me like his character that much more. Speaking of things caught in the machine, this really was a chickens coming home to roost moment for Jones. These creatures who came back deformed with their intestines hanging out were really a thing to see. They served as a stark reminder that as important as the machine has become, it came at a great cost. This is particularly important because the machine has very much become an everyday fact of life that no one puts that much thought into anymore. So, the 12 Monkeys has started doing more with the Witness but it very much feels like too little to late. They have been dragging out the role of the Witness since season one. We need much faster positive movement at this point. It's bad enough that somehow the plague isn't a problem and that the Messengers and ending time is this seasons new thing. 12 Monkeys just seems to be jumping all over the place without an rhyme or reason which is a problem time travel shows tend to have. 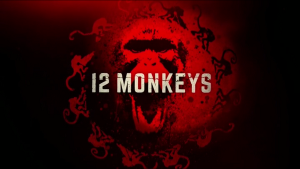 12 Monkeys needs to pick a big picture, stick with it and have a story revolve around it in order to give the show a sense of cohesion. At this point, despite the losses, this episode it feels like its spinning wheels looking for a point.